Today, we present the Chroma Photo Booth. A practical solution for those who would like to have more than a conventional photo booth at your event. A photo booth that allows your guests to choose a background to their liking for the photos they take. A more surprising, dynamic, and fun service. The chroma key or green screen is a technique that’s been used for over 50 years in photography, cinema, and television. An everyday example is the weather forecast on television: although we see the weatherman in front of a map, he is really in front of a flat, green-colored surface. This technique consists of a computer process which subtitutes a given color, normally green or blue (different colores for any skin tone), with a digital image. WHAT IS A GREEN SCREEN PHOTO BOOTH? 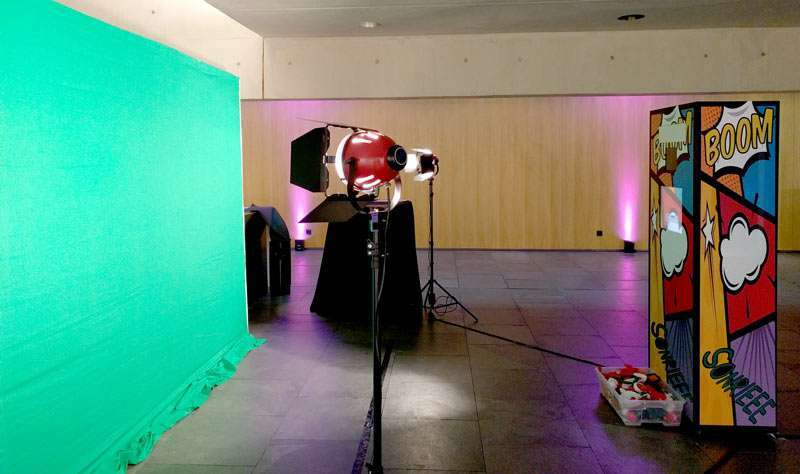 At Fotomaton Barcelona, we have adapted this technology to our photography equipment, preserving the appearance and presentation of the service for the photo booth event. In order to guarantee the necessary background color, we set up a backdrop of a very specific green color, concretely the color Pantone 354C. In the case that we produce it ourselves, we will use the following ink proportion: CMYK 81,0,92,0. To ensure that this technology functions properly, it’s very important to have a very even light in order to avoid shadows that alter the tone of the green color. It’s also very important that the surface of the fabric is matte so that the light doesn’t bounce off. At Fotomaton Barcelona, we provide the specific lighting system for this type of service which fulfills all of the necessities for the chroma effect, and which allows for precise adjustments in every situation. It’s very easy to get a Chroma Photo Booth for your event. Simply decide on the theme and send us a few photos or illustrations that will serve as the simulated backgrounds. This way, the guests who take photos of themselves will be able to choose among up to 16 different backgrounds. At Fotomaton Barcelona, we’ve seen to the development of a fast and intuitive interface through which its users can select an image among the proposed ones, and preview the final result in real time (a system that we’ve already incorporated into our conventional photo booth service). Don’t hesitate to hire a Chroma Photo Booth for your event if you want to surprise your guests. Besides enjoying unlimited photo prints, the attendees will have a good time with the interactive backgrounds.